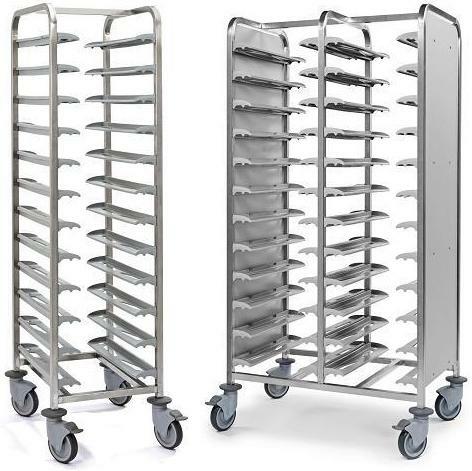 Catering trolleys and ancillary equipment for holding canteen trays and cutlery manufactured in either stainless steel or a range of trolleys in steel and epoxy powder coated offering a more economical way of modernising your canteen.Merlin also provide a very wide range of canteen units. 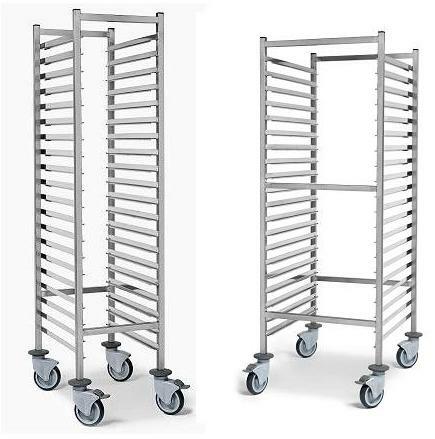 7 level Catering preparation trolley, constructed from 304 grade stainless steel. Overall height of unit is 854mm. 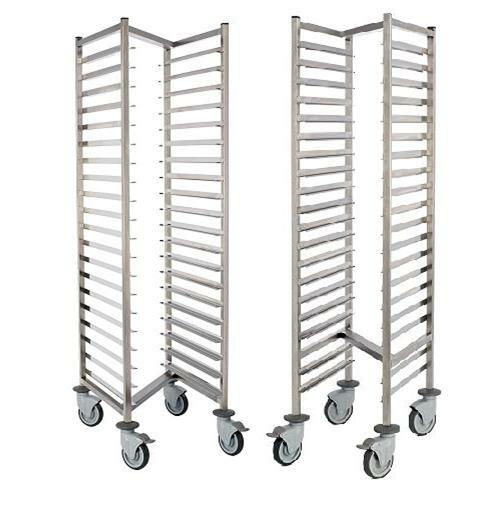 Catering tray trolley constructed from 304 grade stainless steel. 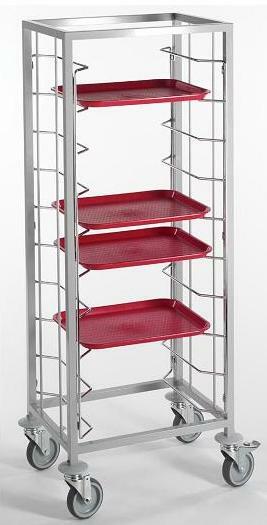 A food container trolley suitable for catering trays, constructed from 304 grade stainless steel. 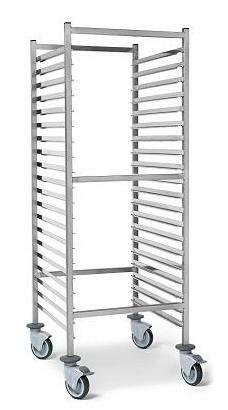 1650mm high, fitted with swivel castors, 2 of which are braked. A 304 grade stainless steel catering tray trolley, with 80% nestable feature. 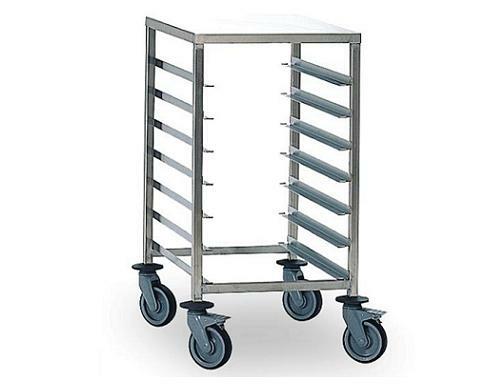 A tray clearing trolley, constructed from 304 grade stainless steel. 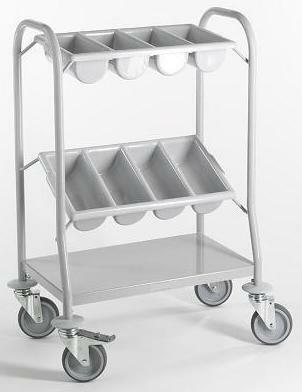 A cafeteria tray clearing trolley, constructed from 304 grade stainless steel. 1700mm high, supplied with 4 swivel castors, 2 of which are braked. Other colours for runners and end panels also available – please contact us to discuss your requirements and for a quote. 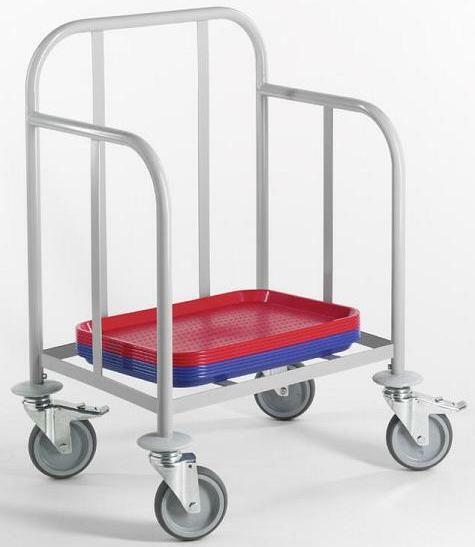 A tray clearing trolley, manufactured from steel with a grey epoxy coating. Non marking swivel castors, 2 braked. Accommodates tray size of 450 x 350 mm. Epoxy coated tray stacking trolley, for bulk storage and distribution of canteen trays. For bulk storage and distribution of cutlery, in easy-to-clean epoxy coated finish.